SALE! Playing Card Sets in Custom Imprinted Vinyl Cases – Blank/Stock Sets Also Available! These Playing Card Sets come with two decks (one red deck and one blue deck) in a custom-imprinted, snap-shut black vinyl case. 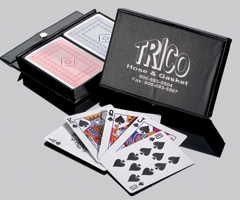 The Playing Card Cases can be custom printed with any one- or two-color design/message that you choose. Each Two-Deck Playing Card Case Set measures 3¾" Wide x 5-1/3" Long. See below for volume pricing on two-deck playing card sets in blank (non-imprinted) snap-shut vinyl cases.